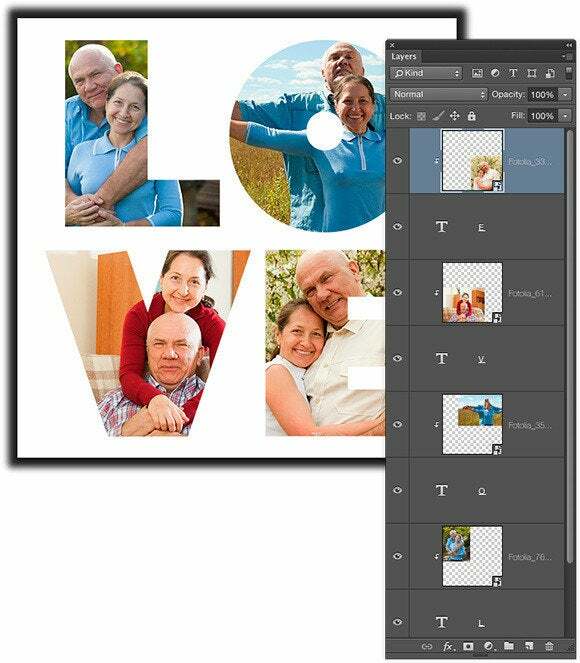 One of the many advantages of an image editor that supports the concept of layers—Adobe Photoshop, Photoshop Elements, and Pixelmator, to name a few—is that you can push a picture through the content of other layers. In this column, you’ll learn how to push a different picture through each letter in the word LOVE. Not only is this technique a fun project, but it also makes a super sweet Valentine’s gift. If you go the extra step of printing it, you could frame it or the lucky recipient can tack it onto their fridge, and then use it as a bookmark later on. The following steps are for Photoshop, but you can easily adapt them for use in Photoshop Elements or Pixelmator. Choose File > New to create a new document at the size you desire. If you’re going to print the piece, enter between 240–300 for resolution; if not, enter 72. Press T to grab the Type tool, click within your document and add the first letter—don’t worry about formatting just yet. While the Type tool is still active, mouse away from the first letter and Shift-click to create another type layer. Enter another letter and repeat until you’ve created each letter of the word on its own layer. Activate the type layers by Command-clicking near their layer names in the Layers panel or, if the topmost type layer is active, Shift-click the bottom type layer. Some good font choices that are already on your Mac include Arial Black, Charter Black, Futura Condensed ExtraBold, Gill Sans Bold, Gill Sans Ultra Bold, Hoefler Text Black, Impact, Iowan Old Style Black, Phosphate Solid (Yosemite or higher), or Superclarendon Black. You can also search Google’s free fonts for thick fonts. With the Type tool active, choose a big, thick font from the font menu in the Options bar and increase the font size so the letters are really big (Gill Sans Ultra Bold at 244 points was used here). It doesn’t matter what color the text is, but you do need a big, thick font so there’s room for the photo to show. Press V to grab the Move tool and drag to reposition the letters so you’ve got fairly equal space between the letters and between the edges of the document. Perhaps the most challenging part of this project is finding pictures where your subjects are close enough together to fit inside a letter. 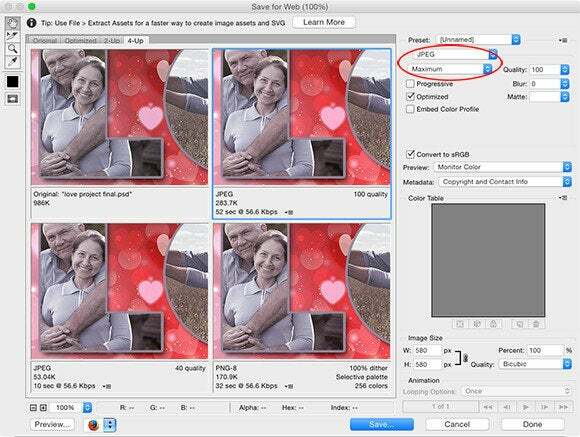 Once you’ve rounded up some pictures, activate the “L” type layer and choose File > Place Embedded. Navigate to where the photo lives and click Place. Photoshop adds the image and surrounds it with a resizing box; just Shift-drag any corner handle to resize it. 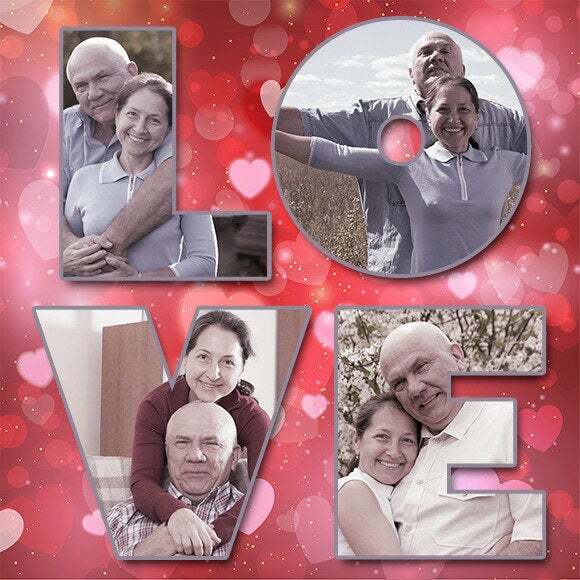 Press V to grab the Move tool and position the photo atop the letter you want to push it through. Choose Layer > Create Clipping Mask to push the image through the shape of the layer beneath it. To resize the image inside the letter, press Command-T to summon Free Transform, Shift-drag any corner handle, and press Return when you’re finished. To reposition a photo inside a letter, ensure the image layer is active and then use the Move tool. For this technique to work, the image layer must be positioned directly above the type layer that you want to push it through. When you’re finished, activate the “O” type layer and repeat this process until you’ve plopped a picture into each letter. 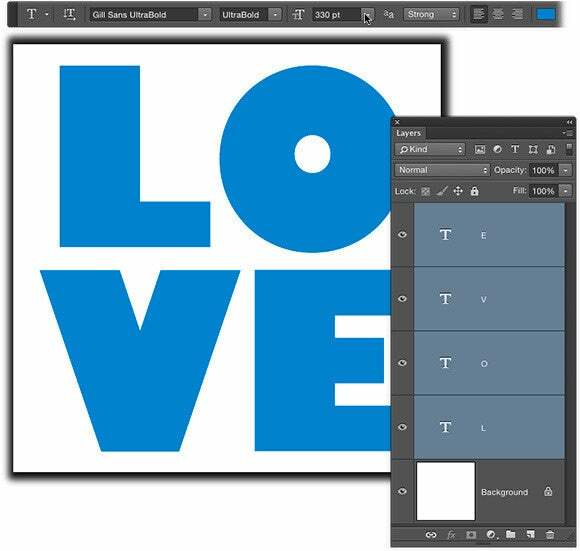 To make the letters stand out, try adding layer styles such as a stroke and a drop shadow. You can also add a festive background image as the bottom layer in your Layers panel. Since it’s unlikely that the colors in your photos will match, try adding a color tint to introduce consistency across the imagery. Activate the layers that you want to tint and then pop them into a layer group (folder) by pressing Command-G. Next, choose Layer > New Adjustment Layer> Hue/Saturation. In the resulting panel, click the clipping icon (circled) at lower left to clip (restrict) the adjustment layer to the contents of the group. Back in the Properties panel, turn on Colorize (also circled) and then experiment with the Hue and Saturation sliders to find a pleasing color. To tone down the color tint, reduce the layer opacity of the Hue/Saturation adjustment layer (75% was used here). If you added a stroke to each letter as described earlier, it’ll take on the same color tint. 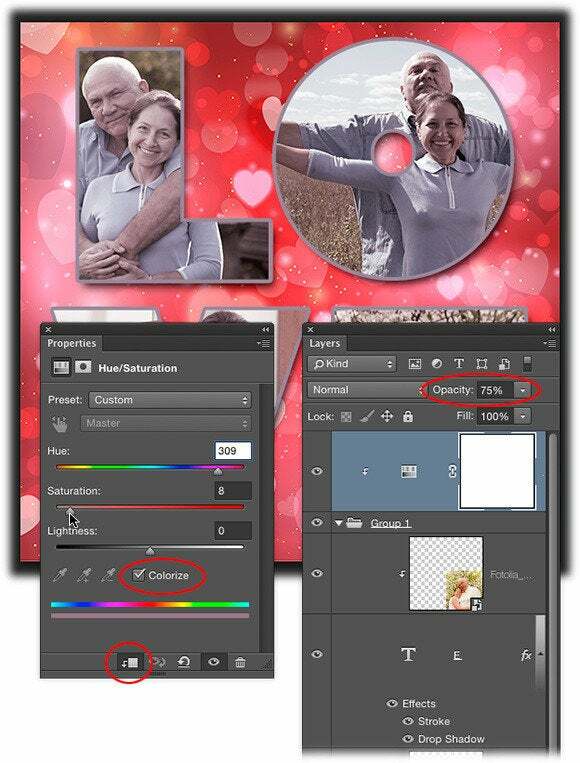 To save your document with the layers intact, choose File > Save As and choose Photoshop from the format menu. To print your masterpiece, just choose File > Print. To prepare a copy to send via email, choose File > Save for Web. From the menus at upper right, choose JPEG and Maximum. If you’re posting the image on Facebook, choose PNG–8 or PNG–24 instead; that way, Facebook’s compression algorithm won’t completely destroy the quality of your image. Photoshop’s Save for Web dialog box lets you visually compare the image using different file formats and quality settings.